Monroe Extinguisher provides a 13 point inspection of your fire extinguisher to ensure the fire extinguisher will work in the event of an actual fire emergency. 1) CLEAN EXTINGUISHER – using degreasing solution. 2) VISUAL EXAMINATION – is performed on entire unit. Carefully inspecting for signs of dents, rust, corrosion, pitting or other shell damage. 3) CHECK PRESSURE GAUGE – to ensure that the extinguisher is fully pressurized. 4) LOCATE MOST RECENT TEST/MAINTENANCE DATE – to determine need for required hydrostatic or internal maintenance. 5) WEIGH EXTINGUISHER – to ensure correct amount of extinguishing agent. 6) REMOVE DISCHARGE HOSE – to inspect for signs of blockage. 7) REMOVE LOCKING PIN – to be sure locking pin can be easily removed in the event of an actual fire emergency. 8) CHECK HANDLE/LEVER – for smooth discharge operation. 9) INVERT/LOOSEN AGENT – lightly tapping the fire extinguisher using a rubber mallet ensures free flow of extinguisher agent when the fire extinguisher is operated. 11) CHECK MOUNTING – to ensure fire extinguisher is installed securely on correct mounting hook/bracket. 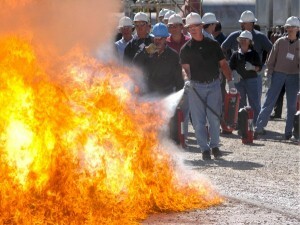 12) CHECK HAZARD APPLICATION – to be sure that the fire extinguisher is the right type for the potential fire hazard. This 13 point inspection is required for any/all fire extinguishers located in a non-residential building per code.